Huge thank you to Crown Publishing for these copies! One of the most highly anticipated releases for 2018 that you do NOT want to miss out on! In 2016, Eddie is fully grown, and thinks he's put his past behind him. But then he gets a letter in the mail, containing a single chalk stick figure. When it turns out that his friends got the same message, they think it could be a prank . . . until one of them turns up dead. That's when Eddie realizes that saving himself means finally figuring out what really happened all those years ago. As an extremely hyped up book, I went in with a little bit of trepidation.. hoping beyond hope that the hype wouldn't let me down. You know those books that are SO hyped up you go in and while it's good, you don't quite get why everyone is RAVING about it? It's great but you just expected THAT much more because of all the hoopla? Yeah, well this one delivers! Going from 1986 to 2016, we see through Eddie's eyes. We get that Losers Club feeling with him and his guy friends back in the 80s with their token girl, Nicky. Running away from bullies and just otherwise being kids trying to find fun in their every day lives. Cue tragedy. Fully grown in 2016 they end up reconnecting somewhat while another death brings their past up to the surface. In a gist - PUT THIS ON YOUR TBR. It's gloomy, a bit graphic in some instances, not a happy read in any sense of the word, but absolutely worth your time. Here is a book that has been getting a lot of hype. 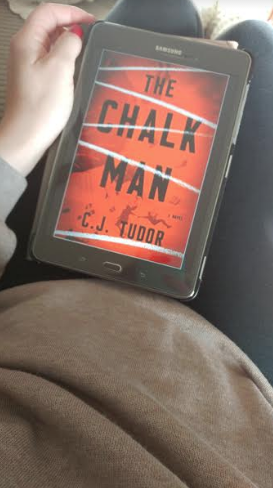 Like with any other highly anticipated and talked about book, I went into THE CHALK MAN with an open mind. I didn't want to build it up too much before reading it. Well, let me tell you, this book completely deserves all of the hype and praise it's been receiving! First of all, the beginning of the book, that grabbed me right away. We follow Eddie throughout the book (and it's told from his perspective), but the reader goes back and forth from 1986 to 2016. In 1986, Eddie and his friends are all close and growing up, but they still have their secret code they speak in. They call them the chalk men - as you'd suspect they're chalk stick figures used to communicate with one another. 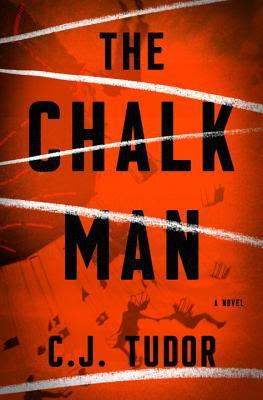 Until one day, when a chalk man leads them to a body, their lives are forever changed. Fast forward to 2016, Eddie is grown up and has his past behind him. One day he gets a letter in the mail containing a single chalk man. He finds out that his friends have also received the same letter. When one of them turns up dead, Eddie and his friends realize they need to figure out what happened all those years ago in order to save themselves. This was a fantastic read. Really dark, gloomy, and at times graphic. I read this book in one sitting and I could not put it down. The ending was crazy! I found myself thinking, what the hell did I just read?? I completely agree with my buddy reader, Chandra, that it is so hard to believe that this is a debut novel. There's no way. 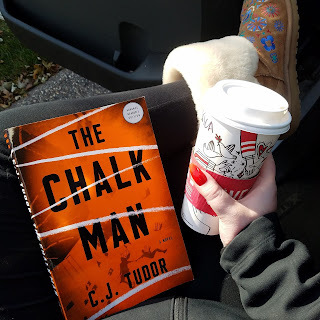 I will definitely be picking up more by CJ Tudor in the future. Now that the end of the year is quickly approaching (like really quickly…what in the world is happening??!! How is time moving this fast??!) I have been gearing up to read all of my most anticipated 2018 titles. 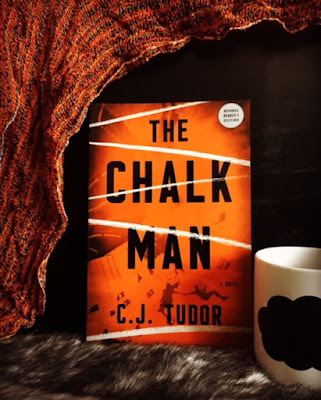 One of the titles I had been most eagerly awaiting was the highly talked about, psychological suspense novel, The Chalk Man by CJ Tudor. Now that I have finished this novel, I can understand why there has been so much buzz surrounding it. Fast paced, completely compelling and bingeable, I sat down and read this book in an entire sitting #sorrynotsorry. From the core mystery to the intricately woven characters, I am calling this one of my favourites of 2018, already! The novel is told in two alternating time periods in the life of our protagonist, Ed. In the present, the loner high school English teacher lives with a lodger and keeps to himself, but, in the past, Ed, known as Eddie back then, was a part of a gang of kids whose lives changed forever after a summer of chalk men and a dismember bodies in the woods. As past and present collide, Ed must confront his past and through several twists and turns, the truth of what happened in 1986 will be revealed. So, first thing is first, I am shocked that this book is a debut. HOW?? HOW?? I can not get over the perfectly fleshed out characters, the timing of the plot and the sheer genius of the prose. The plot is perfectly rolled out, building suspense and leading the reader to its perfect resolution. There were no muddled bits or confusing characters; everything felt like it fit and were equally important. This is so rare in any book, let alone a thriller! What. A. Debut. My favourite thing about this book, by a landslide, was the characterization. This book, from the opening of the first flashback chapters, had a dark “Goonies’ vibe to it. I have seen the 80s revival thing done well with popular Netflix shows like Stranger Things but had never seen in accomplished in a novel. Tudor manages to do it expertly. The flashback chapters felt nostalgic and realistic; almost like it could have happened to any kid, in any place, over the course of any summer. This familiarity brought something chilling to the text and I was hooked. Each character is so perfectly developed, from the protagonist down to the bullies; even the secondary characters had a clear image within the text. I was completely invested in them. Truthfully, the plot became secondary to me because I was so wrapped up in the characters. This will be a book that I will be thinking about for a long time. If you want a book for the top of your TBR in 2018, make it this one. You won’t regret it. Can I give a book 6 stars?